Ventilation on all sides. Front access door mounted on ball bearing slides for standard insert. Units are completely welded and don't make a sound. Includes front platform, non skid sprayed inside, and stainless steel water bucket. Measures 44" x 25" x 31" tall. Easy installation - 2nd row seat out...insert in. Driver's seat goes ALL the way back. This is the complete package. 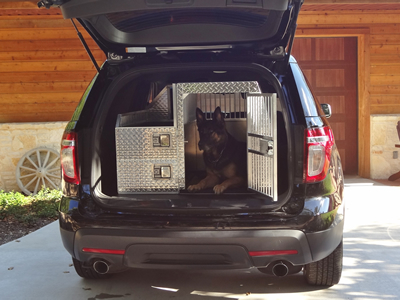 The crate is angled to fit the new Interceptor and comes with all of our standard features. This is a great unit with a large single drawer for gear storage. 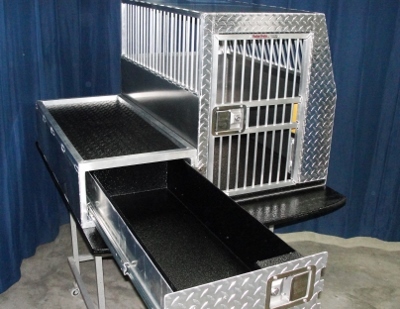 Drawer and crate are keyed alike for easy use. Crate is latched to mounted equipment box for easy removal for cleaning.